Visit us on Saturday 31st March for our Yamaha MT Range Easter Demo Day! We will have the full MT Range available for demonstration rides at Flitwick Motorcycles on the 31st and will be running an out-ridden test route for groups throughout the day. This should provide a perfect opportunity to ‘experience the darkside’ and get acquainted with your Yamaha MT model of choice. Machines available for test ride on the day are the 2018 MT-10, MT-09, MT-07 & MT-03 model variants (please ask if you want to test-ride a different model – if we have one available we would be happy to sort something out), so there is something for everyone. Bookings are on a first come first served basis on the day only and are subject to our licensing terms and conditions (*see below) and availability. 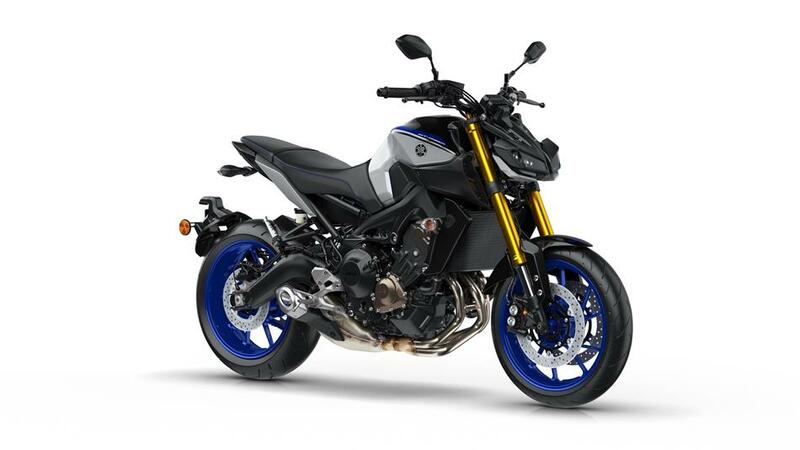 The New Yamaha MT-09 SP has arrived in the Flitwick Motorcycles showroom, so why not come and have a look? I wouldn’t hang around, however, it’s already been sold! Don’t worry though, we’ll be getting another one in soon. If you liked the MT-09 you’ll love the SP! Taking the colours from the R1-M and adding a fully adjustable Ohlins rear shock with a remote adjuster, along with upmarket Kayaba front forks with dual rated springs and adjustable preload, compression and rebound damping. All of these combine to make the MT-09 SP an absolute hoot to ride and a very capable machine when pushing on a bit. Don’t take our word for it though – come and have a look! The MT-09 SP is hitting the showroom at £8999 plus on the road charges. The long-awaited new Shoei Neotec 2 has arrived in the Flitwick Motorcycles showroom. A big improvement over the already excellent original Neotec, the new helmet has been refined to make it smaller, quieter and warmer than it’s predecessor. We all think they look great, but more importantly they feel great when you pull one on as well. Don’t take our word for it though, why not pop into the shop and try one on yourself? Alternatively they’re available to purchase on our website! Flitwick Motorcycles have been a Yamaha Dealer since the 1970's. A family business, we specialise in New Yamaha Motorcycles and Scooters, as well as used machines from a wide range of manufacturers. Being a Yamaha Premier Exclusive dealer means that we have instant access to the complete Yamaha range, including all the latest models and colours and that we are able to provide the same to our customers. Why not pop in to have a look at what we have in stock, or give us a call to arrange a test ride? Flitwick Motorcycles are able to offer competitive finance rates on both new and used machines, including Hire Purchase and PCP deals. Just ask for details! What Type of Bike are you Looking For..? Here in the UK a Motorcycle Helmet is the only bit of riding gear you are required to wear by law. Now obviously we would recommend that you go above and beyond when it comes to protecting the rest of your body, but it is true that your head is the most important part to look after… without a head the rest of you isn’t much use! Here at Flitwick Motorcycles we stock a huge range of Motorcycle Helmets to fit all sizes of head and budget. What Brands of Motorcycle Helmet do you Stock..? Why Change your Motorcycle Tyres..? Tyres are cheap compared to crash damage! A good set of tyres will transform your bikes handling. Tyre technologies are constantly evolving – newer compounds have better grip & better wear! Fresh tyres inspire confidence & a confident rider is a happy and fast rider. What Brands of Tyres do you Stock..? At Flitwick Motorcycles we offer a one stop shop for all things biking. Whether that means a top-of-the-range new helmet for your head, a replacement brake-lever or a shiny new tail tidy to complete your bike, we’ve got it covered! Can’t get here? Not to worry – although we’re primarily a traditional bricks and mortar shop, we also run an Online Store with a huge range of motorcycle clothing and accessories in stock. At Flitwick Motorcycles we have always specialised in hard parts. From Oil, Filters, Cables and Spark Plugs to Levers, Footrests, Fuel Tanks and Fairings – we can fulfil your order of genuine parts for your motorcycle (we can also supply pattern parts to order) . Call us now to discuss your requirements! By subscribing to our newsletter you will always be up-to-date on our latest promotions, deals, news and events!